Featured! The Bottle Wrench Home | About Us | Opportunities | Sponsorships | Contact Us! This week we had the pleasure of connecting with Jake Crawley who is the designer and proprietor of ‘The Bottle Wrench’. If you love beer (or anything in a bottle) and tools – Jake has a serious treat in store for you! 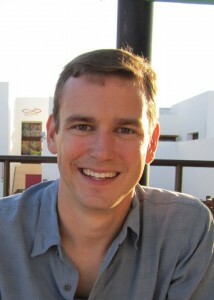 My name is Jake Crawley and I’m in my late twenties. I’m a guy with a PR degree, too much time on my hands, and a deep desire to make/tinker/create and share my ideas. I’m lucky enough to be living in historicSavannah,GAwith my “overly supportive” wife Kristen and my sidekick Roxie the Shop Dog (our Lab/Basset hound mix). 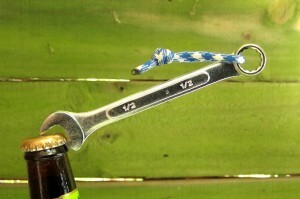 I make Bottle Wrenches, they are the manliest bottle openers you’ll ever own! I love the Bottle Wrench! Where did you get the idea for this ‘up-cycled invention’, and how have they evolved over time? Like most great ideas, the Bottle Wrench came out of a problem. Being tired of having to use the wife’s wine bottle opener to crack a cold one the decision was made to come up with something tougher, stronger, and manlier. 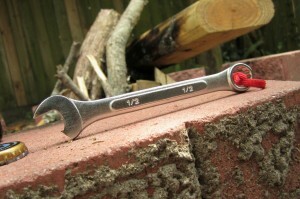 A few hours (and beers) later, the original Bottle Wrench was born. Soon after, people started asking about my new opener and wanted to know where they could buy their own. We opened our online shop in 2011 and have been growing ever since. That’s great! I’ve heard nothing but good things from people who have a Bottle Wrench… what do you think the biggest perk is that people get from using one? This is easy, they get to take any ordinary task/item such as opening a bottle and make it awesome. The Bottle Wrench is meant to be shared and shown off to others. It’s an item that you can take to a party or hang on the fridge and wait for the comments to start coming your way. If needed, you could also still us it as a wrench (worst case scenario). Where can people find your shop online? Right now we sell most of the Bottle Wrenches in our Etsy shop. Etsy is such a great marketplace for us because it is full of shoppers LOOKING for handmade, one-of-a-kind items. Etsy has also given us as sellers a lot of tools to help grow our business. It’s a win-win. We are growing in other areas too. We’re already planning on going to some of the larger beer festivals in our area because that is our target market (and we like drinking free beer). But, the most exciting area or growth is in wholesale. We’re already working with a few customers in the Southeast and just closed a deal with Paul Deen Enterprises to start working with them. It’s exciting stuff with a whole new set of challenges. 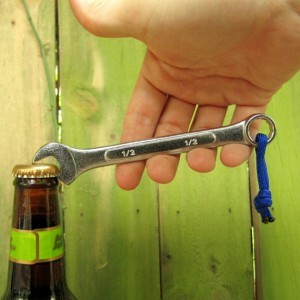 Check out The Bottle Wrench on Etsy by clicking here! Wow! A big congrats is in order! Handmade Men is all about Etsy for the same reasons you stated, and seeing the success you’ve found through embracing the handmade lifestyle is really inspiring! Why do you think it’s important for men to connect with the handmade and one-of-a-kind market? Men MUST connect with one-of-a-kind items to stand out in today’s world. Anyone can open a copy of GQ and be told what to wear, eat, drink, and like. But it takes a true man with his own tastes to look beyond that noise and find items that they appreciate themselves. If we had more men like this in the world and less “GQ” guys we would be a lot better off. Also, I think that if more guys did seek handmade items they would sooner or later want to learn how to create their own versions. This would lead to more guys tinkering in their shops, garages, or basements coming up with the worlds next great ideas. Just think, Apple was started in a garage by a guy named Steve. We agree completely! There’s something so natural and fundamental about using, wearing, and working with things that other people made my hand – it just seems ‘right’! In your opinion, what makes handmade items more valuable than their mass-produced counterparts? Craftsmanship. In today’s world of Wal-Mart, Amazon, and Buy-n-Large you can find almost anything for $0.99, but those items are not meant to be “cherished” like handmade items. A handmade item tells the story of the artisan that poured into it by planning and creating it. Handmade items also help tell the world a little something about the person that owns them, they say that this person truly cares about _________. You can’t get that with a cheap, plastic version. What challenges have you faced in making the Bottle Wrench what it is right now? The biggest challenge we face is that there are a million ways to open a bottle. We have to cut through all of the other options and show people that while there might be a million ways to do it, the Bottle Wrench is the manliest way possible. Overall it’s been fun, though we try not to take it too serious and keep it lively which people seem to enjoy. We also truly love our product and believe in it which helps. On a side note – We’ve also learned that taking (good) pictures of chrome wrenches is not an easy task. Why should men be supporting local business, small business, and especially handmade businesses like yours? What’s in it for the individual and for our shared economy? When you support local artists you’re supportingAmerica(and I’m not joking). You’re not supporting some huge conglomerate that spends millions and millions of dollars overseas, you giving funding to a real person that will have a little extra cash to spend in their community. We also need artists to keep our sanity, without art or creativity everything in the world would be exactly the same and that would be no bueno. Do you have any quotes or inspirational sayings that keep you going each day? Around the shop we live off of a few quotes but the main one is “Done Is Better Than Perfect.” Without this quote we would not have started selling Bottle Wrenches at all. With each new project, it’s easy to keep trying to make it “perfect” but sooner or later you just need to hit “Go” and see where it takes you. There is no such thing as perfect and there is always room for improvement. It’s ‘open mic’ time… what do you want to say? I would like to encourage people to take a risk on their ideas. We’ve all come up with great ideas, but too few act on them. Next time you see a problem or a way to make something better, make it happen. You’ll be glad you did. Bottle Wrench, local microbrewery, good times… in that order! Here’s how to find Jake and The Bottle Wrench online… make sure to connect to see all of the amazing things that come from his shop! Tagged bottle wrench, handmade bottle opener, handmade men, handmade mens, jake crawley, mens gift ideas, the bottle wrench. Bookmark the permalink. How cool is that. Nicely written too! Kudos to Jake and his “Bottle Wrench” and what an awesome interview!! Agreed! Thank you so much fobr the comment!